The A.P.T. stands for: Active Passive Trainer. Active – working your muscles against the different levels of resistance. this is the best way to strengthen muscles, and increase endurance. Passive – the electric motor moves you to increase blood circulation, flex muscles and joints, reduce spasms and swelling. CAN ANYONE USE THE APT? Almost anyone, regardless of age, and abilities. It is most popular with those needing some type of Motor Assisted movement for Arms and Legs. You can start using the APT if you have exercising, or not at all. If you are bed ridden or mobile. People with M.S. to regain strength and independence, and reduce fatigue. People after stroke to regain their strength, coordination, movement and flexibility. Paraplegics and Quadriplegics to improve circulation, range of motion, reduce spasms and swelling. Children / Teens (with Cerebral Palsy for example). People using Walkers, Canes, Wheelchairs, scooters use it at home, or in Community Centers. See summaries of research done using the APT. IS THIS NEW? IS IT A PROVEN SYSTEM? The APT has been used for over 30 years worldwide. then across Europe, Asia and North America. MACS has been distributing the APT in Canada for over 18 years. 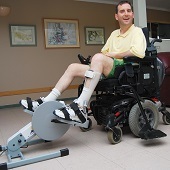 MACS is the official distributor working with leading Rehabilitation Hospitals Canada wide, Physiotherapists in M.S. Clinic and Nursing Homes, physiotherapists in private practice and in Recreation Centers – making the APT available for people of all ages and abilities. Research on using the APT has been conducted from Japan to the University of British Columbia (M.S. Clinic.) proving that regular exercise with the APT is both safe and effective. The APT Base unit comes ready to use right of the box. The cost will depend on the system you need. For many the Classic APT-1 model is all they need. Some wish for the more advanced APT-5 model. Models may range from as low as $2400 to $4400. Get only the accessories you need. Sometimes we have units that were rented and are DISCOUNTED.